Home › Valley of flowers › Way to Ghangaria from Govindghat made. 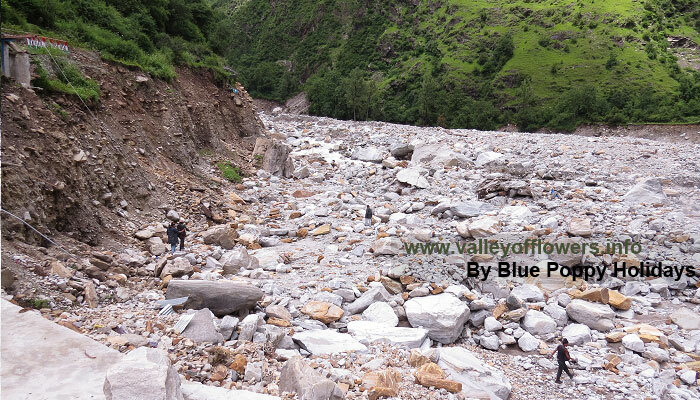 Trek between Govindghat and Ghangaria is cleared. After a long time I am happy to announce a good news that the trek between Govindghat and Ghangaria is officially cleared for human beings. But ponies can not cross River Alaknanda at Govindghat using present bridge. Moreover, there is no road/trek from NH-58 to the bridge. Officials hope that everything will be done by 10th September, 2013. The present bridge at Govindghat also needs to be enhanced so that ponies can also cross over. It is very important that ponies cross over because almost all the supplies to Ghangaria are taken over ponies. I have returned from Ghagaria recently and some of the pictures taken enroot are presented below. The Bridge over Alaknanda at Govindghat. The Bridge over Alaknanda at Govindghat. It is not possible for ponies to reach at the starting point of this bridge in the background you can see crushed buildings of Gurudwara at Govindghat. Govindghat after the flood. Vehicle parking and some of the hotels are washed away. Govindghat before the flood, you can see lot of vehicles parked near the Alaknanda River. Is not we human beings entered in the territory of the river. The trek between Govindghat and Ghangaria is washed off at many places and I need to trek through the river bed or from forest at some places. I went to Ghangaria 13th August, 2013. Now I have learnt from a local that trek between Govindghat and Ghangaria is fully operational. It means we can easily go up to Hemkund Sahib at any time. Bhyundar village is completely washed off. New constructed trek near Bhyundar village. 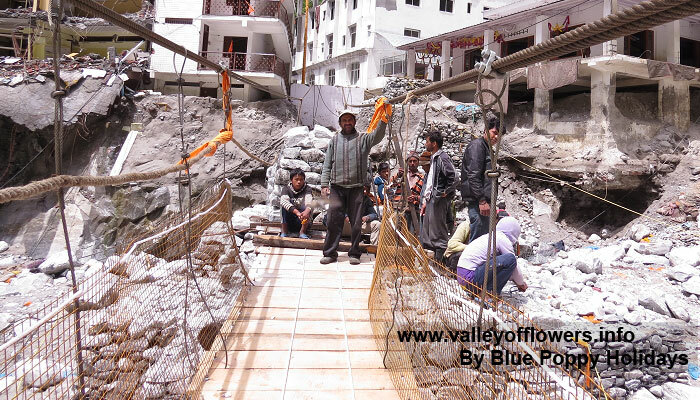 Bridge being constructed at Bhyundar. There is high possibility of accessing Valley of Flowers in September 2013. The trek between Govindghat and Ghangaria is constructed. Earlier we used to cross River Pushpawati somewhere 3 kilometers after crossing Bhyundar Village but now the trek after Bhyundar village is almost washed off so now a new trek is made from the other side of the River Pushpawati right from Bhyundar Village itself and a bridge is constructed on Pushpawati River at Bhyundar Village. Ghangaria is completely deserted as you can see in the picture below. 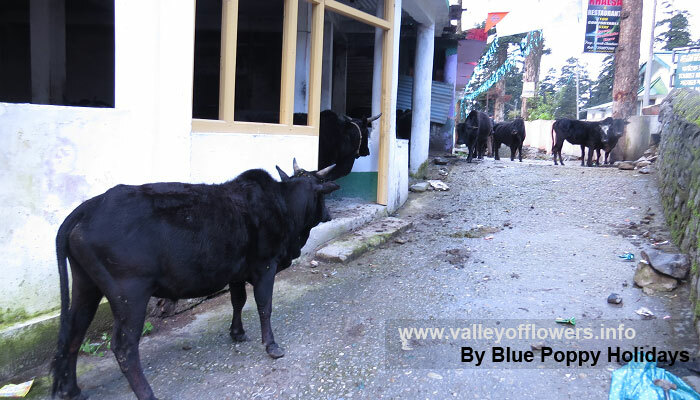 Ghangaria Village – only few cows are witnessed at Ghangaria. In this time of the year Ghangaria has never witnessed such dryness of human beings in the history. 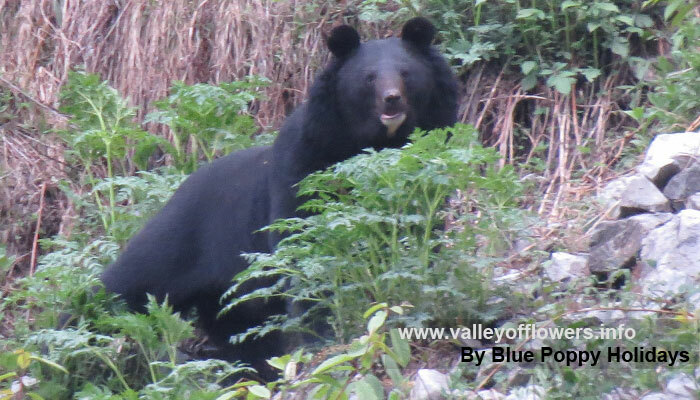 While coming back from Ghangaria I saw a bear on the other side of River Pushpawati. Following is the video of this Bear. After considering all the news and reports of Valley of Flowers, Ghangaria, Govindghat we can make out that the trek to Valley of Flowers may open by 15th September, the trek to Hemkund Sahib will open by 10th September. There is no official announcement by Gurudwara Committee to reopen Hemkund Sahib Gurudwara. 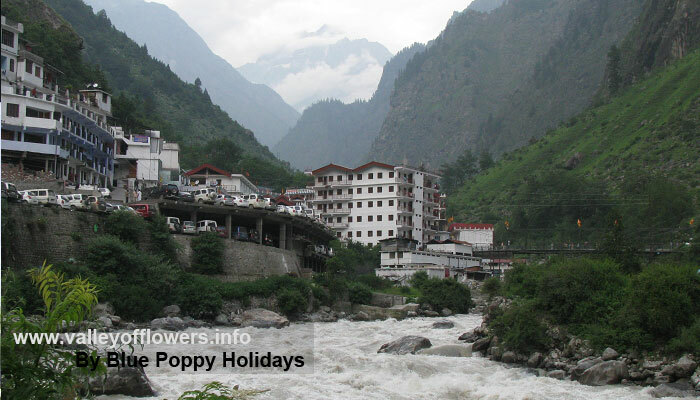 But for nature lovers there are many flowers at Hemkund Sahib Lake and nearby areas. A local has recently come back from Hemkund Sahib and told me that he saw lots of beautiful Blue Poppies, Braham Kamal, Bistorta Affinis and many more. In the second half of September the number of flowers at Hemkund Sahib is much more than the number of flowers in Valley of Flowers. 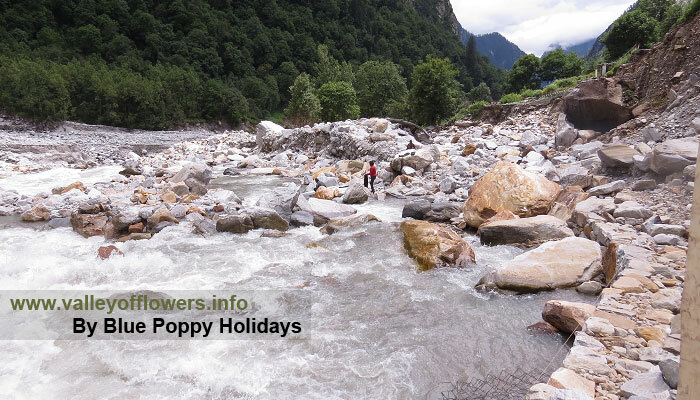 So now we can plan for Valley of Flowers trip in September and if we are lucky we can enter valley, otherwise we can definitely go up to Hemkund Sahib and witness the beauty of nature. Please let me know when Valley of Flowers open. I had to cancel my visit to Valley of Flowers scheduled in August. 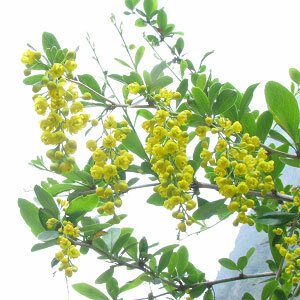 I want to come if there are flowers in October 2013. 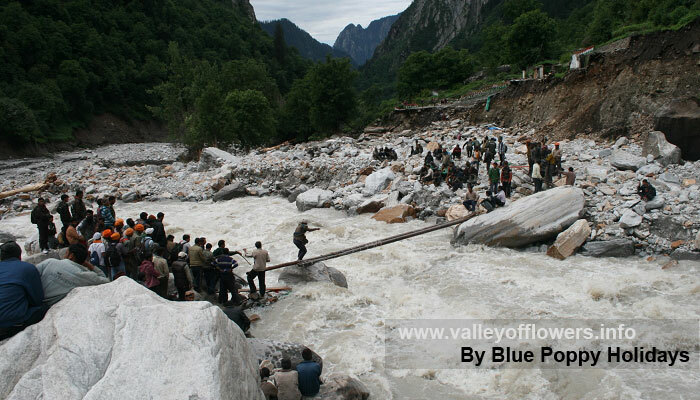 The Valley of Flowers is not accessible till date as a bridge is to be constructed over Pushpawati River near Ghangaria. 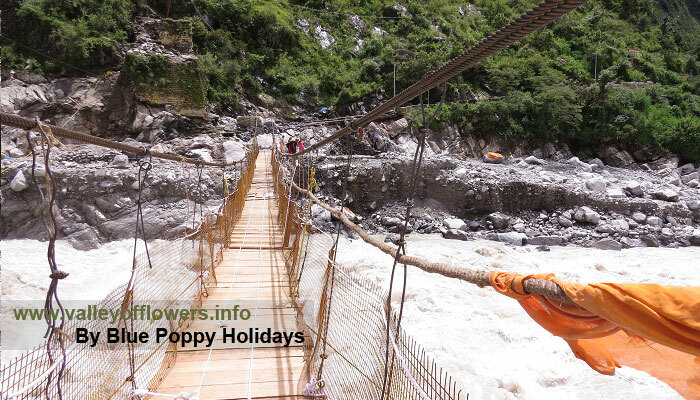 However Hemkund Sahib will open on 21st September, 2013. There will be flowers at Hemkund Sahib. Hemkund Sahib will reopen on 21st September and will close on 10th October in 2013. The trek between Govindghat and Ghangaria is already open. Road between Rishikesh and Govindghat is perfectly all right and open. 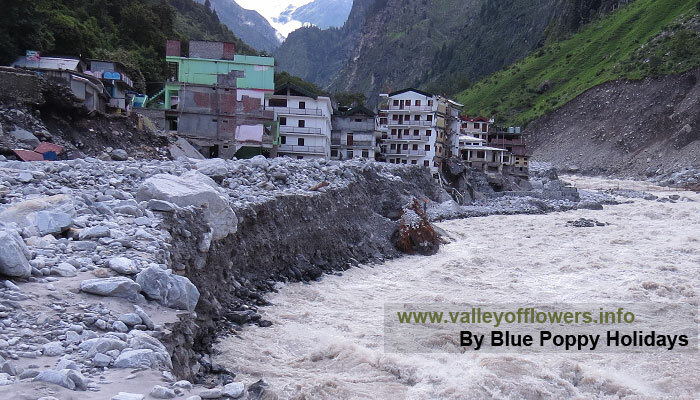 At Govindghat most of the hotels are washed off but I have tie up with Hotel Bhagat and arrangements can me made. At Ghangaria some hotels will be open. If you want hotel booking can be done. You can call me at +91 9991142759 for more details. fortunately there is no loss of life in the area. The picture of the bridge shows it to be under construction but the bridge is already constructed as of now. I will be posting latest information at regular intervals for the benefit of all. Thank you for these excellents news and for the video of this quiet and cute bear. Fortunately, it was on the other side of the river ! I am sure that a reasonable and organized “green” tourism could contribute to a sustainable development of theses marvellous valleys. Certainly a good news for Valley of Flowers trek lovers. But have we learnt lesson from the disaster? There may not be life as on date as developmental part may be in progress. Moreover, there may be probabilities of rains. What about roads washed away before govindghat like srinagar? The road up to Govindghat is already made and it in good condition. Hope we human beings learn a concept of sustainable development.